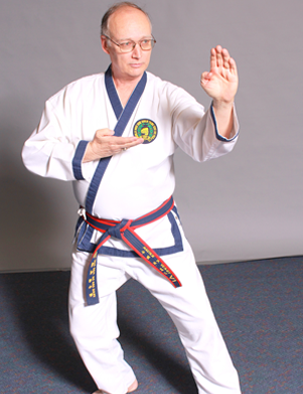 Master Paul Yeagy, 7th Dan (#15143) was first introduced to martial arts in the service in 1967-1969. After leaving the Army in 1969, a new family, full time job, and going to college prohibited Master Yeagy from studying martial arts until his youngest child expressed an interest in studying Karate. A local dojang was teaching Tang Soo Do and master Yeagy and his two children began their martial arts training in 1984. Master Yeagy earned his 1st Dan (Black Belt) in 1987. He continued training and teaching martial arts several times a week for the next several years and was awarded his Master belt in 1995 from Grand Master Jae Joon Kim. Master Yeagy is one of the original founders of the Michigan Academy of Martial Arts along with Master Olivero. Master Yeagy graduated from Siena Heights College in 1978 with a B.S. in Computer Science and a minor in Math. He worked for Ford Motor Company (1965-2006) in Product Development in several different capacities during a 41 year career. Master Yeagy has been involved with the Boy Scouts of America for 25 years as Scout Master, Assistant Scout Master and merit badge counselor.